Ghassan Salamé, the Special Representative of the Secretary-General and Head of the UN Support Mission in Libya (UNSMIL), briefs the Security Council. The political process for a successful post-conflict transition in Libya has made significant headway over the past two months, the United Nations envoy for the North African country said Thursday. “The re-launch of the political process has created a new momentum,” Ghassan Salamé, the Secretary-General’s Special Representative and head of the UN Support Mission in Libya (UNSMIL), told the Security Council. “I am pleased to see many constructive and peaceful debates on the future of the country,” he added. The Action Plan for Libya was launched two months ago. The Plan is made of various ingredients, including amending the Libyan Political Agreement, organizing a National Conference, preparing for elections and providing humanitarian assistance, he explained. Libya is a nation without stark ethnic or sectarian divides, but with good education and a wealth of natural resources. Many challenges faced elsewhere are not there. “But what might be mistaken for a homogenous nation, is actually a country divided at an atomic level,” Mr. Salamé said, noting that in the wake of the 2011 conflict, the national polity has been replaced by competing individual agendas. “Reconstituting the Libyan national polity is a must,” he said. Based on the Action Plan, the UN convened two sessions of the Joint Drafting Committee, composed of members from both the House of Representatives and of the High Council of State, to agree on a set of amendments to the Libyan Political Agreement. He welcomed the mutual recognition of the two assemblies, and their acknowledgment of the Libyan political agreement as the sole available framework to end the crisis in Libya. Any mechanism to select a new Presidency Council and Government must be transparent and fair. UNSMIL is currently exploring the possibility of hosting the National Conference inside Libya. The National Conference, slated for February 2018, will give Libyans from all across the country the opportunity to come together in one place, renew their common national narrative, and agree on the tangible steps required to end the transition. As for elections, the High National Election Commission is working to initiate a voter registration update before the end of the year, which will be the first such exercise since 2014. The international community stands fully ready to support the process. The Constitutional Drafting Assembly was elected and mandated to produce a new constitution and they have completed their draft. The constitutional process must now move forward, he said. Beyond the Action Plan, there are three very serious challenges on UNSMIL’s agenda; impunity for grave crimes, the economy of predation and the erosion of frozen assets, he said. Second, politics in Libya is strongly shaped by economic predation. In an environment of protracted insecurity and lack of accountability, the shadow economy has been flourishing. Billions of dollars are lost every year in illicit money transfers. Thirdly, beyond predation, hundreds of millions more are being silently lost due to poor management of Libya’s frozen assets. Freezing the assets is one thing, however, their mismanagement is another. There is a need to revisit how Libya’s external wealth and investments are taken care of, so that they are not silently and gradually lost for future generations. 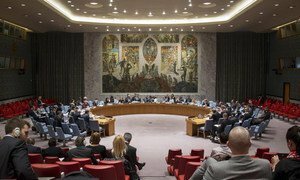 The Security Council today endorsed the United Nations’ action plan to resume an inclusive political process in Libya.